Not just another cake recipe, but another chocolate cake recipe. I don’t know what’s happened to me. In my defence/aggrandisement, several customers have said this is the best brownie they’ve ever eaten, so see this as a public service announcement. I know, I’m too kind. Brownies are one of the easiest but also one of the most abused of cake recipes. Relying not on aeration and raising agents but on obscene amounts of butter and chocolate, they really are just as good as their ingredients. Unfortunately, not having the cachet of the Frenchified chocolate mousse cake, people seem more inclined to mess around with them. Start adding too much flour, add any baking powder, or worst of all, cook it past the point of gooeyness, and you’ve got a cake. Maybe a very nice cake, but definitely not a brownie. Their construction means they aren’t cheap to make, but neither should they be – if they were, we’d all be fat as houses. So. 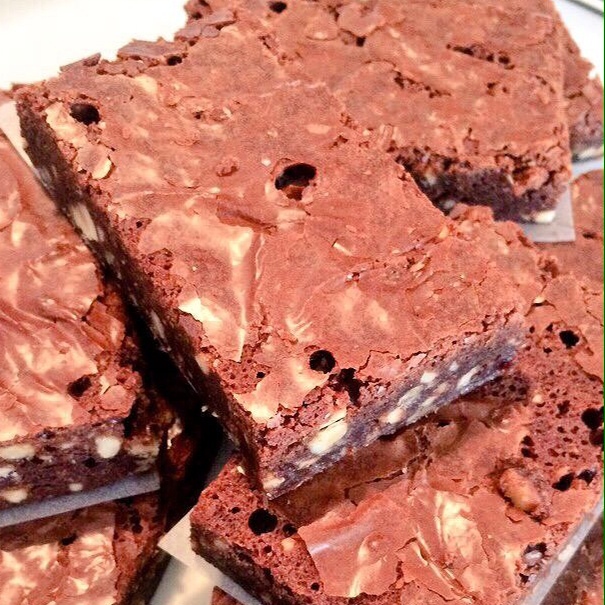 Your basic brownie is chocolate, butter, sugar, eggs, and generally nuts, held together with a whisper of flour. As you’re using the latter in such small amounts, and only for its binding properties, this is an ideal opportunity to go gluten-free, and make the coeliac in your life very happy. See this, however, not as some Hemsley-esque deprivation – I’m not going to start wittering about superfoods and broth – but as a chance to pile in more flavour. Your basic flour doesn’t really taste of much, which is rather the point, and neither do a lot of gluten-free flour blends, being made of ground rice and other tedious things. Buckwheat (not a wheat), however, has a pleasantly hoppy bitterness which cuts through the richness nicely. I used to have a very good brownie recipe gifted to me by my first head chef, but I lost it a couple of years ago, so the basic amounts here are taken from Justin Gelattly’s excellent Bread, Cake, Doughnut, Pudding, which I freely recommend to everyone. Heat the oven to 180C/Gas 4 and line two small trays with parchment. Set the chocolate and butter in a heatproof bowl over a pan of simmering water, and leave to melt. Whisk the eggs and sugar together with the salt until just combined. Blitz the nuts with the flour (this’ll help stop the nuts from breaking down into butter), pulsing to keep the nuts mainly in discernible chunks. Whisk the chocolate mix briefly into the egg mix, again until just combined, and then fold in the flour mix. Pour into trays and bake for 25 minutes. The surface should be cracked and glossy, the whole not quite set. Leave to cool before attempting to slice. These are good from the fridge or even straight from the freezer.